by Natasha Graves, UK South Blogger jaBlog! As summer is quickly approaching for all the young writers around the world, it goes without saying that we all need a fantastic summer reading list. 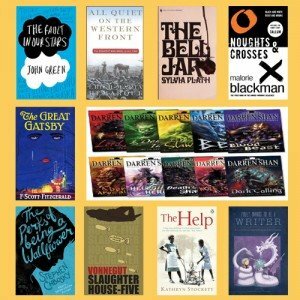 That’s why I’ve scoured the bookshelves and dug up some young adult classics to compile a list of ten killer novels for every young literature enthusiast to crack away with this summer. WARNING: Please note that some of these books may not be suitable for younger readers. 1. The Fault In Our Stars by John Green. Personally, I am a massive John Green fan, and I don’t think this list would be complete without a reference to quite possibly one of the greatest authors in the genre of young adult fiction. With the movie having just been released, I would say it’s more important now than ever to read this popular, warm-hearted, funny, and gripping novel for young adults. It’s a real page-turner, so you could probably squeeze this book in whilst the film is still in cinemas. I always say read the book then watch the movie, so get reading! This isn’t your typical young adult fiction, but I would say the summer of 2014 wouldn’t be complete without a book which reflects upon World War I. With the centenary encouraging as all to remember those who fought courageously one hundred years ago, there is no better way to do this than by immersing yourself in what has been credited as the greatest war novel of all time. One of my personal favourites, a tragically accurate representation of a failed coming-of-age story. It’s not exactly the most up-lifting novel you’ll ever read, but I think it’s a vitally important book that has definitely withstood the test of time. The story of Esther Greenwood, a young aspiring poet, is a definite must-read for all young writers. The most addictive series of books you’ll ever read. These books tell an epic tale between two lovers and two races town apart by brutal racism and discrimination. However, the world is flipped on its a head and white people instead of black people are the discriminated minority. These books are skillfully balanced between being emotional and personal as well as deeply political. An all-time American classic, if you haven’t read this tale of the roaring twenties and the failure of the American dream, I suggest you do so this summer. It’s a short book, but perhaps it’s for those with a higher reading age or for those wishing to challenge themselves a bit. This book is great for expanding your vocabulary and getting to grips with a deeply fascinating decade. For all horror-loving young writers, this series is the master in the genre of teenage gore. Not only is it jam packed with action, horror, and suspense, but it also has a deeply personal touch with human aspects that appeal to every teenager out there. I warn you ,though, this series is not for the faint hearted. It still scares me at age 17. This series really does appeal to all ages and genders. I first read this series at age 11, and I unashamedly revisited it last year. For me, it will go down as one of the best young adult series of all time. Give it a go. One of my personal favourites, this semi-autobiographical novel is a bizarre yet eerily realistic portrayal of the horrors of war. This book can teach a young writer a lot about the importance of form and structure in a novel. As Vonnegut shows, structure can be integral to the meaning of the whole novel. Once you have read this short and very readable novel, you’ll have plenty of inspiration regarding the art of structuring your own works of literature. A truly inspiring, emotional, and riveting novel. A perfect summer read for every young writer, it’s entertaining, charming yet deeply powerful, what I believe to be the perfect mix in a novel. This hugely popular novel should definitely be near the top of every young writer’s reading list. Of course, last but not least, Laura Thomas’s very own debut novel is a must-read for every young aspiring writer. Not only are you provided with a fantastical and exciting story about young Polly and her journey towards reaching her dreams, but you also get invaluable quality writing guidance from Laura Thomas herself. What more could a young writer wish for? With the plentitude of outstanding 5-Star reviews pouring in from young writers around the world, I don’t think any young author could afford to miss out on reading Polly Wants To Be A Writer this summer. Thank you so much for writing this! I’ve been observing book list of some top books of good literature to dig into this summer but this is by far the best list I’ve found. I have read The Fault In Our Stars and The Perks of Being a Wallflower, but I have to say, I didn’t enjoy The Perks of Being a Wallflower for the reason that it was much to explicit. Besides that, I am excited to read the books on this list that I haven’t already read. I actually finished The Great Gatsby only a couple of days ago, after it was recommended (and given as a Christmas gift) well over a year ago! It’s turned into one of my personal favourites and I love the descriptions it brings. I’m not particularly a fan of horror, but I think I will try the Demonata Series by Darren Shan, as you love it so much! I’m not one to miss out on great books, no matter the genre. Here goes… (Thanks for the recommendation!) And I’ve been wanting to read All Quiet On The Western Front for a while, so maybe this summer is the opportunity I’ve been waiting for. Did you know that there is actually a fourth Noughts and Crosses book called Double Cross, and a novella set before Knife Edge called An Eye for an Eye?